NPR's All things Considered just ran a program on the melting permafrost in the Siberian tundra. The landscape is changing so rapidly that scientists studying it have concluded that human-caused climate change is behind it. As we predicted in the early 1990s, there's a critical barrier. Once global warming pushes the melting process past that line, it begins to perpetuate itself. As the number and size of lakes in the tundra increase, the surface area of white frost and surface lichen shrinks and the region absorbs more heat, further increasing the lakes as more permafrost thaws. 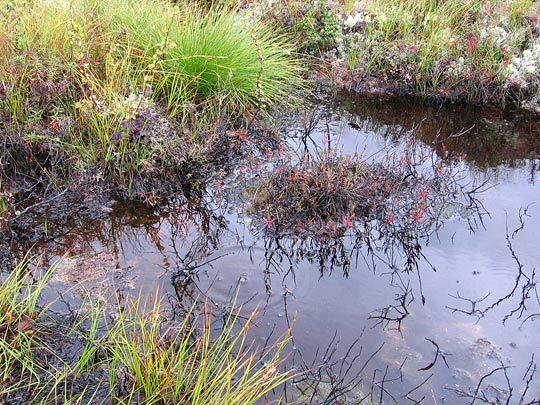 On a larger scale, the melting permafrost releases the carbon dioxide and methane gas that are trapped inside the permafrost, further accelerating global climate change, which also increases local temperatures and melts still more permafrost. Also, the methane that bubbles up prevents the lakes from freezing, so they continue to absorb heat through the winter. It's a positive feedback loop: the output of the system causes the warming dynamic to accelerate. In any system, positive feedback loops are a sign of instability. Imagine, for example, if eating caused you to feel more hungry instead of less. Of course, the article is on NPR and therefore makes the obligatory nod to "balance", quoting a scientist at Russian oil company Gazprom who claims the warming is just a natural cyclical process. The only problem is is that such a natural cyclical process has not been observed in the geological record. The sheer rate of change is unprecedented. As more time passes without real, concerted action on climate change and more systems move from linear change into exponential, positive-feedback instability, our collective ability to rein in its pernicious effects will continue to slip away.